Have you ever been watching a movie, television show, or music video and noticed a scene that sparked your interest? Knowing the limitations of production, some scenes make you curious on how it was shot. How did they get that high, move that fast, and/or make a continuous shot so fluid? Luckily, when we get these questions we’re just a quick internet search away from the answer. More and more directors, cinematographers, and other productions workers have been open to revealing their secrets of production with the strangers online. Which is good for us, because this gives us an outlet to find creativity and resourcefulness in our own work. When you have a scene in your mind that you’re not sure how to capture, think outside the box. Anything can be a resource. To show you what I’m talking about, let’s focus on single continuous scenes. The camera operator for the movie Straight Outta Compton used a kind of pulley system and pole to pull off this incredibly fluid pool scene. 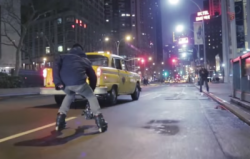 In this clip, the camera operator used a pair of rollerblades to get a continuous shot from varying speeds and directions. It’s really cool but slightly nerve wracking. In this music video for BTS (a Korean pop band), the director made the talent get involved and do a little work in order to create the illusion that they were popping up out of nowhere. The behind the scenes actually looks pretty funny. The point is, next time you’re filming a scene don’t be afraid to try something new. Do whatever you can to get the shot you want. Use unexpected pops or equipment that will help you achieve your goal. You may even have to get in an uncomfortable position but it will be worth it!